Welcome to this month’s Secret Recipe Club! 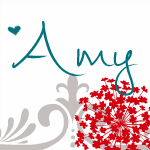 This month, I was assigned Danielle’s blog, Mostly Food and Crafts. Danielle is a stay at home mom of two who enjoys cooking and crafting with her children. Danielle also has so many fantastic recipes on her blog! I actually have several others on the menu for this week, but the one I decided to share is a delicious sweet treat! 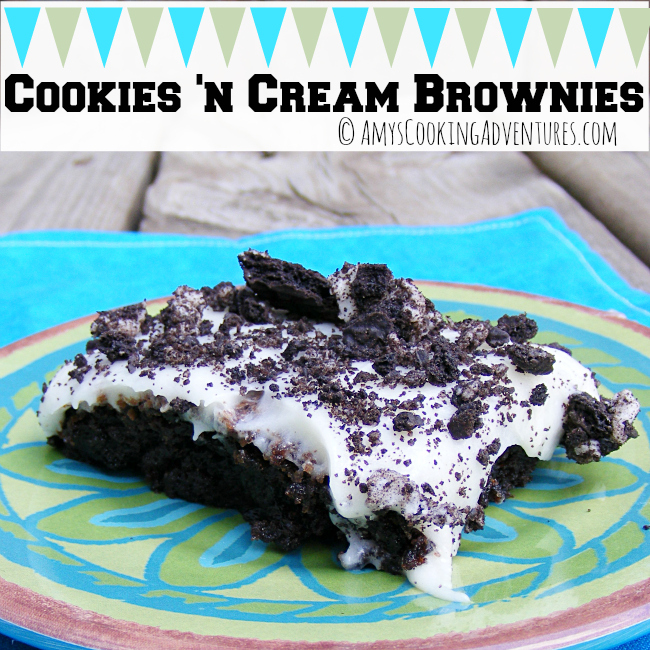 I’ve been wanting to make Cookies ‘N Cream Brownies for quite some time, but never got around to it. Then, the very day I received my SRC assignment in my e-mail, I just happened to have some leftover cream cheese frosting in the refrigerator (from this Dresden Files Birthday Cake) and a box of brownies in the pantry. It was very serendipitous! The brownies were just as delicious as I thought they’d be and a perfect use for that leftover frosting. Thank you, Danielle for a delicious recipe! Preheat the oven to 350 degrees F and spray a 13x9 inch pan with non stick spray. Place 10 Oreos into a mini food processor. Process until finely crushed. Stir together the warm water and espresso powder. In a large bowl, mix together the brownie mix, oil, eggs and water mixture until well combined. Stir in the crushed Oreos. Spread into the prepared pan and bake for 24-26 minutes. Cool completely. Once cooled, spread the frosting over the brownies. Then, coarsely crush the remaining Oreos and sprinkle over the top. Store leftover brownies, covered, in the refrigerator. Im so glad you liked the brownies - You just reminded me that I need to make these again! This is my kind of brownie. Three cheers for cream cheese frosting. Umm - yum?? Talk about the best of both worlds! 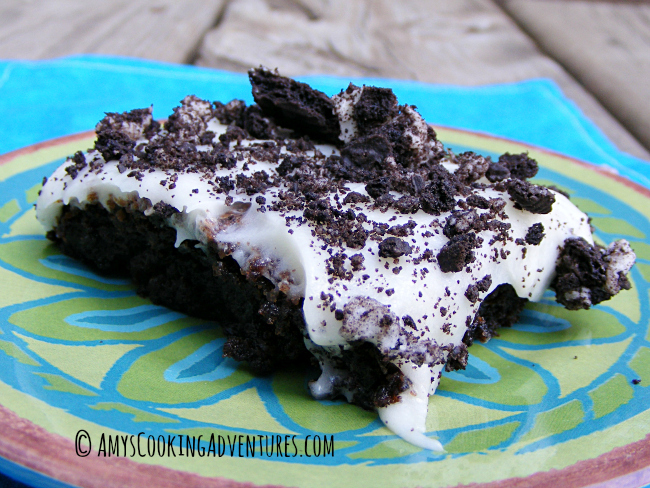 Brownies and oreos all in the same dessert... not to mention cream cheese frosting?? Seriously delicious. Oh I love cookies and cream...delicious! I wish I had some dessert right now. This would do!